Reputation is important for the Kill Team. 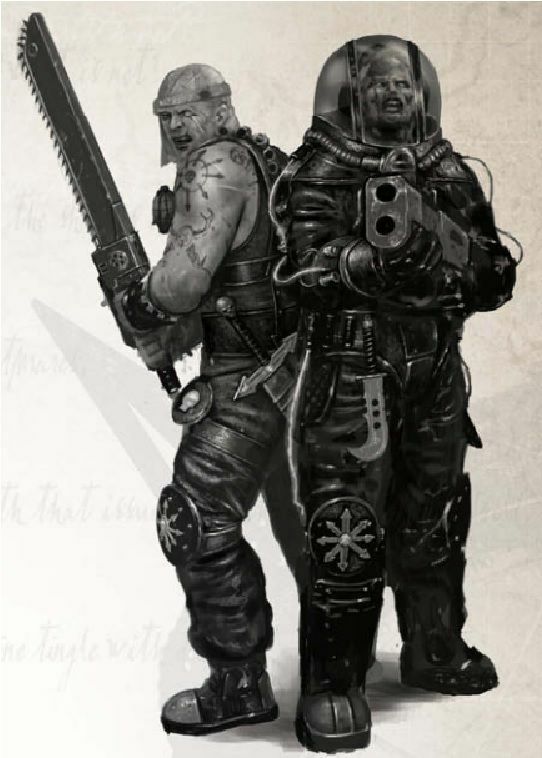 Both the individual characters and the kill team as a whole have a reputation score. 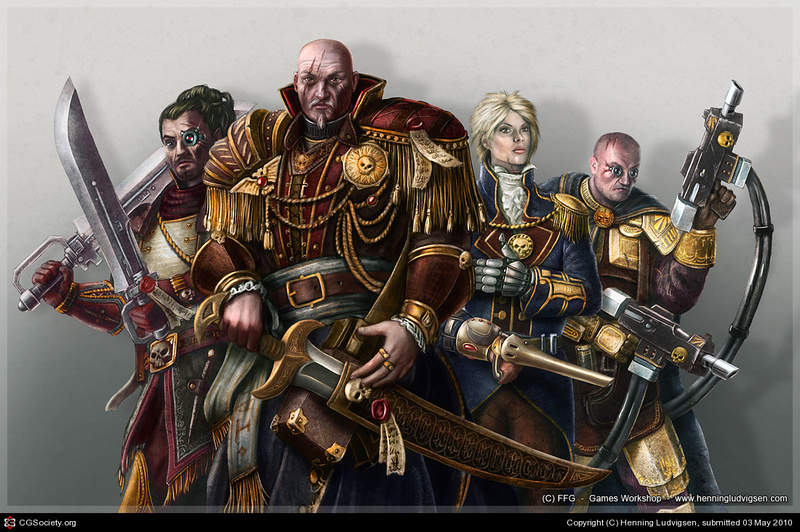 The Kill team must maintain their reputation with potential employers, other Kill teams, and their suppliers. The reputation score determines what jobs they are offered, their influence among those groups, and functions as a source of funds. Whenever the Kill team needs to exert their influence or make a large purchase a skill check is made with the reputation score. Individual characters use their reputation score when making a purchase for themselves or when dealing with their contacts. 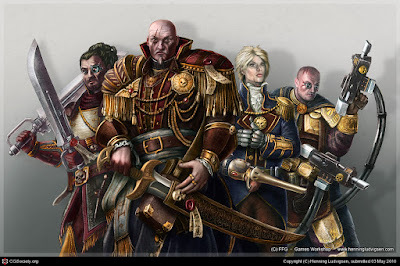 Reputation is increased when the Kill team successfully completes a job or does something especially noteworthy. To make an individual purchase, a character must roll under their reputation score with the following modifiers. A successful roll means the character has acquired one of the item. The location where the gear is being purchased will also modify the roll. The GM will apply a modifier based on the location. 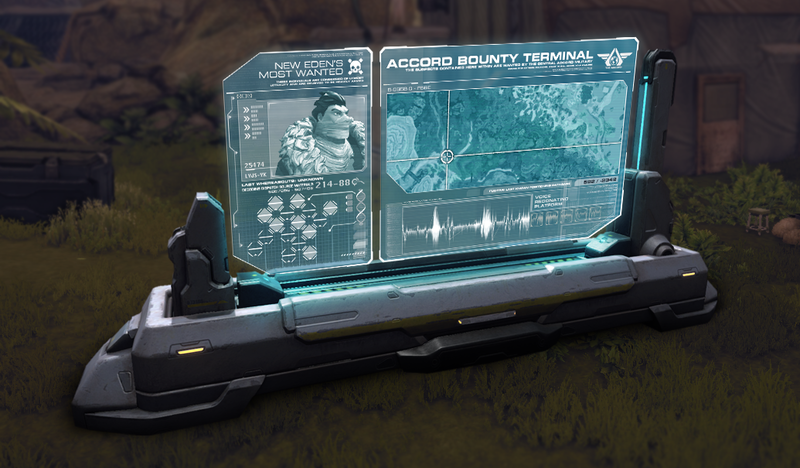 Guns are ubiquitous on a hive world but not so easy to come by on a death world. Having a Peer related to what is being purchased can also help. 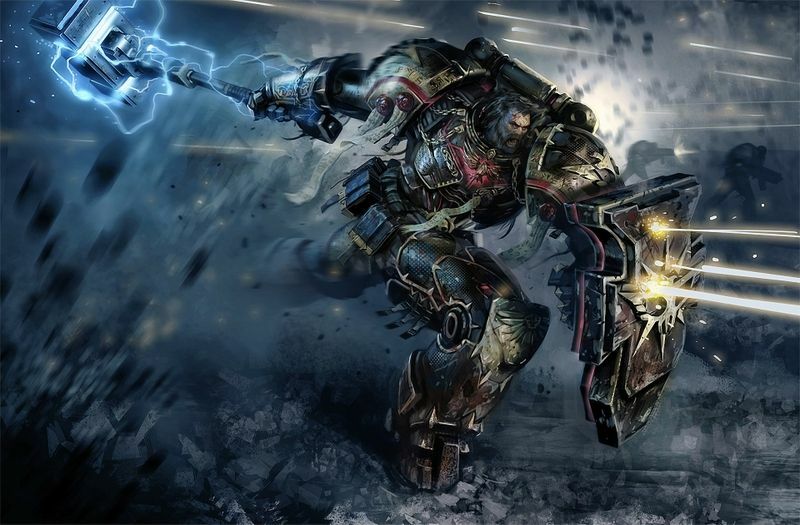 For the Kill team to make a large purchase, such as buying a tank, repair their ship, or hire more crew, use the Kill teams score rather than an individual character's score.The GM will determine if any additional modifiers are needed. If the roll is successful then the Kill Team has made the purchase. In the case of gear, they purchase enough to outfit the entire crew. Earthdawn is a world of high magic. The people of the past used it unchecked and let the Horrors into this world. Astral Space contains Horrors that can mark, attack, or even take control of a spell caster if they are not careful. Spell casters have created spell matrices to hide their magic from the Horrors of Astral Space. Spell Matrix: A spell matrix protects a spell and hides it. A character can spellburn no more than 1+ INT bonus from a matrix spell. Mercurial effects do not activate and Corruption cannot be gained from a spell in a matrix. A spell that is in a matrix is still lost on a failure. Spell casters can place a spell in a spell matrix at any time taking 10 mins. If a spell caster doesn’t have a spell they need in a matrix they can attempt to re-attune a matrix on the fly. Re-attune Matrix on the Fly: A matrix can be quickly re-attuned to a new spell on the fly. The caster takes one round, spell burns 1 point and makes a casting check. If successful he has re-attuned the matrix to new spell. Casting Raw Magic: Casting raw magic opens up a spell caster to the Horrors of Astral Space. It is like shooting off a flare on a pitch black night. Raw Magic can be cast at any time. Spellburn can be used and the Mercurial effect will go off. When casting raw magic, there is a chance that a Horror will take notice of the spell caster. All Spellcasters but wizards gain 1 extra spell and matrix at 1st level. This is to represent their innate ability with magic. Spellcasters choose their starting spells from the list below. All spellcaster progression is the same as a DCC Wizard. All casters get 2 spell matrices at 1st level and additional at 3rd,5th,7th and 9th. The Wizard does not have natural affinity with a certain type of magic. 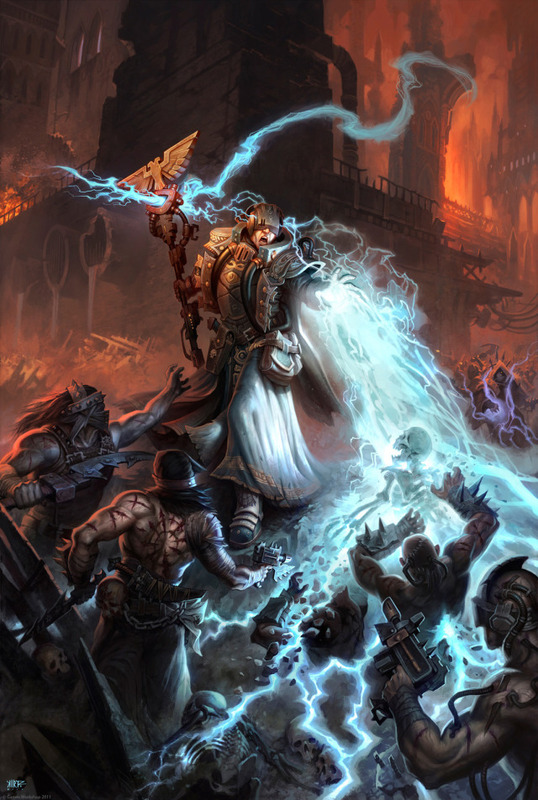 Wizards impose their will and knowledge to cast formulaic magic. Wizards have the ability to cast any spell and are not tied to one tradition. quickly caught on and their magic became less effective. Now they balance real magic, illusions, trickery, and sleight of hand. Nethermancers are spellcasters who specialize in the magic of the netherworlds. Their interests focus on other planes, and the spirits and creatures that inhabit those planes. Most people consider Nethermancers to be a little “off” in an eerie sort of way, and consequently followers of this Discipline are unlikely to win many popularity contests. Nethermancers can turn undead/horror constructs as a cleric of same level. At 5th level they can attempt to turn horrors. five magical elements: air, earth, fire, water, and wood. *Elementalists can Summon Elementals instead of Demons. 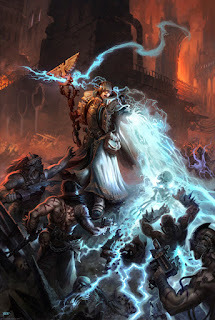 Elementalists can attempt to turn creatures based on the elements as DCC Cleric. My next post will cover Patrons or Passions as they are called in Earth Dawn. The Chains of Judgement began its life long ago in the forges of Mars. During the Heresy it became a renegade ship fighting against the Imperium. 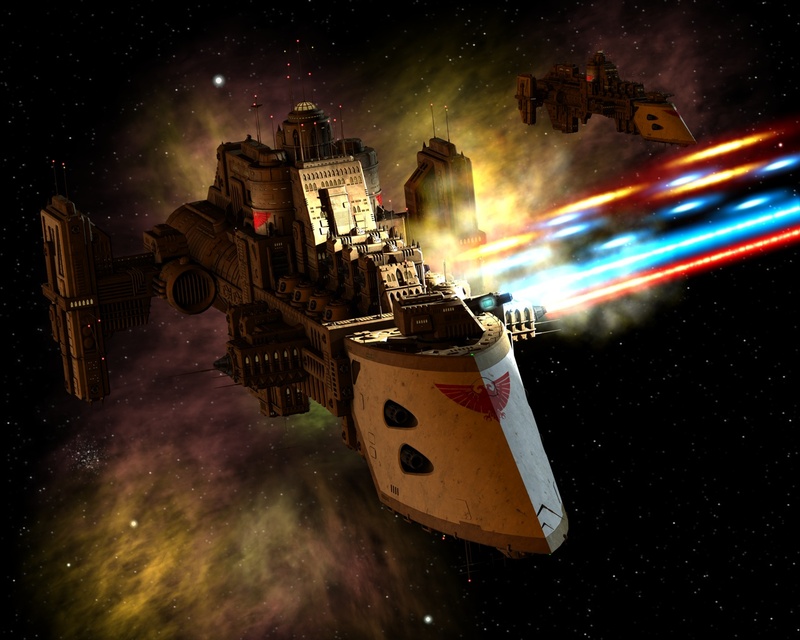 The destroyer was captured by the Angevin Crusade during a battle for the Calaxis sector. 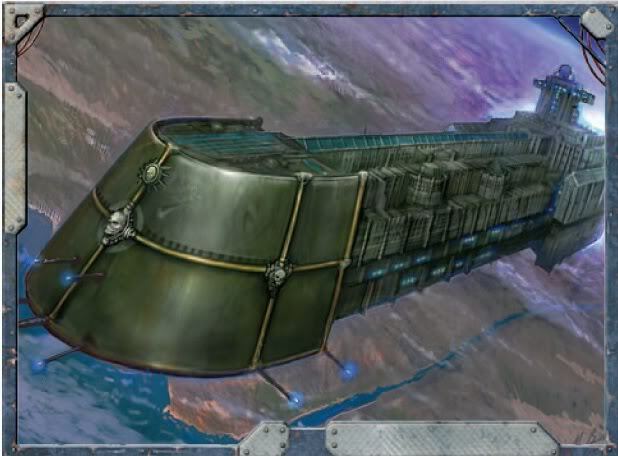 The inquisition acquired the ship and re-purposed it as a prison barge, one of the infamous Black Ships. Now in the hands of the Kill Team, it has returned to being a renegade. Prow Lance has been destroyed and must be repaired before a weapon can be placed there. Mars Pattern Macrocannons in the dorsal mount. The ship also has a torpedo launcher. It is currently loaded with 2 boarding torpedoes and 2 plasma torpedoes. Other systems: Standard Warp drive, Single Void Shield, Standard Life sustainer and crew quarters, Mark 100 auger array. 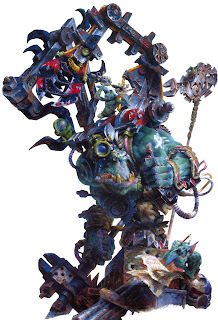 Warpsbane Hull: As a former Black Ship of the inquisition, the hull of the ship is lined with Hexagramatic wards. +10 to pilot through the warp. May reroll Warp encounters. Machine Spirit: As a former raider ship pressed into service by the inquisition the machine spirit is full of anger. +1 Speed and +7 Maneuver in combat. -1 speed -5 to Maneuver and detection out of combat. Prison: The main part of the ship has been converted into a prison. There are specialized rooms for storing particular dangerous passengers in cryo-stasis. Murder Servitors: The ship is equipped with facilities to build and maintain murder servitors. These give a +20 to boarding actions and when defending against boarding actions. Up to 12 can be can taken off the ship for other missions by a tech priest. Destroyed Shuttles: All of the lighters and shuttles have been taken or destroyed. The ship is equipped with 2 boarding torps, and 2 drop pods. The kill team always has its ear out listening for work and new jobs, working their contacts, listening to secret encrypted sub-space channels, and scanning dark noosphere networks. 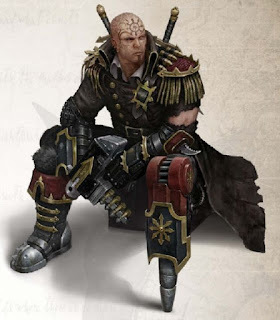 An ex-Rogue Trader's Seneschal on Footfall claims to have information that leads to a great treasure ship. The data is for sale to the highest bidder. The independent world of Skrynne has put put a call for kill team assistance in fighting off an ork invasion. Heavy weapons are a plus. The first mate, Biff Carco, knows of a derelict ship that his crew were planning to raid 20 years ago. It may still be there. The ship was either Xenos or Archaeotech in design. The Cold Trade is the very profitable business of smuggling archeotech and xenos artifacts. On hiveworld Desoluem, the imperial authorities are searching for a group of Cold Trade smugglers. If the kill team can find them first, they might be able to "break in" to the business. On the vortex world of Kymerus, the high priest of the Temple of Lies has sent an Astropathic communique inquiring about hiring your kill team for a specific job. 3. No matter what alignment the players choose, they will role-play Chaotic. 4. The characters will one shot the Big Bad Guy and be TPK'd by a giants rat. 5. Players will choose goofy names for their characters. They think the names are awesome. 6. The wizard will always save it all till the final battle. 7. All plans boil down to "Leroy Jenkins!" 8. "Leroy Jenkins" is not a good plan. 9. The answer is always "Yes," delivered with an evil grin. 10. When in doubt, set it on fire. At North Texas RPGcon this year, I ran my second game of DCC Thundarr. The adventure picked up right where last year's adventure ended. 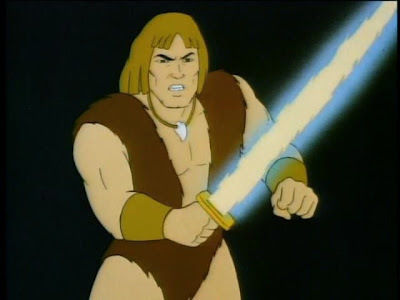 Thundarr and his crew were thrown right into battle against an evil cyber-sorcerer and his devastating Sun Ray! Thanks once again to my awesome players! At the time I promised to post the adventure online to share. Well....I finally got around to it. You can download it piecemeal from the Thundarr Page, or grab the whole thing right here! Go on! Take it! It's Free! 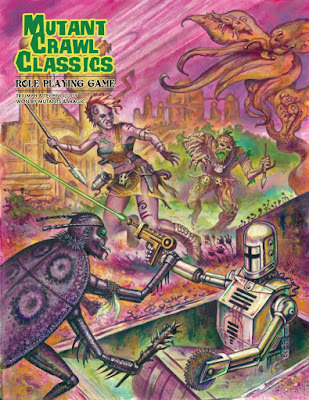 The Mutant Crawl Classics Kickstarter is in it's last 4 days! I already want to start making stuff for the game. The kickstart has funded a whole slew of adventures but we won't see those for a bit. How about all those great Metamorphosis alpha adventures that came out though! Those would all make great MCC adventures. I have to admin, though I love MA I've only played it one time and dont have a good handle on how the stats work. I'm reaching outr to you for assistance. Your assistance comes with a reward however! For everyone who contributes I will randomly select one person to win DCC #87 Against the Atomic Overlords! Which is a perfect MCC adventure. International contributors don't be shy! If you are the winner I'll send you a pdf instead! So let's hear it! How would you convert MA stats to MCC? And don't forget to back the Kickstarter before you miss out! 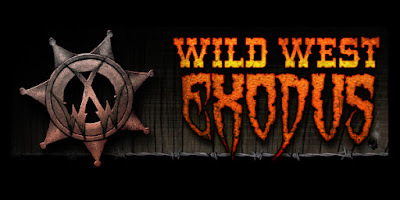 Last year, at Gen Con, I discoved Wild West Exodus. 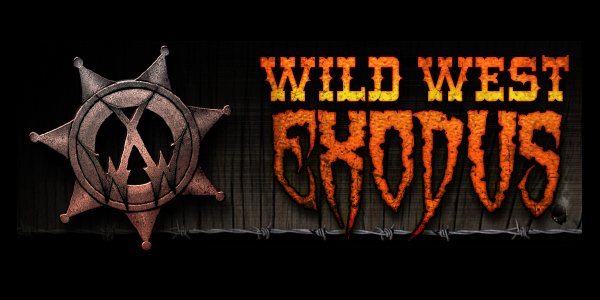 WWX is a skirmish wargame set in the old west with a sci-fi twist. 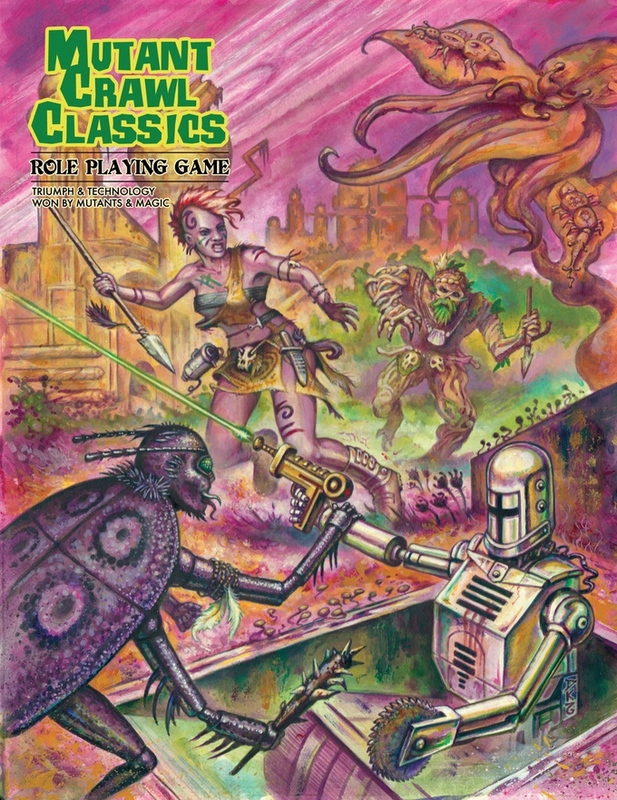 Laser rifles, flying motorcycles, robots, and zombie cyborgs fight for dominance. I was drawn to the awesome models and I love how fast and easy the game is to play. No purchase required to play the game. 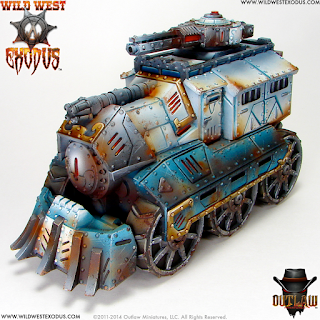 The rules and the stat cards for all the units are available for free on the Outlaw games website. Trust me, your going to want some of the awesome minis. This model of the Lawmen heavy is what really got me. Since the stats cards are available in PDF, I came up with a quick and easy way to create an army list that can be either printed or viewed on a tablet device. 1. Download the stats cards from the WWX site. I use a firefox plug-in called Down ThemAll to make downloading so many files easier. 3. Select combine files into PDF. In Adobe, make sure you select Options and choose single PDF and large file size. 4. Select the individual pdf stat cards for the army. I'll make an enlightened army. Zombie cyborgs FTW! 5. Select combine files and it will create a single PDF with one card per page. 7. In the middle of the print dialog select multiple. 8. I use a custom layout of 2 by 4 cards in portrait. Play around with the layout to suit your needs. For tablet viewing 2 x 2 landscape may be better. 9. Click Properties and select best quality printing. Click Advanced and select 600 DPI. This will make sure the cards don't show up blurry in the final pdf. 11. Change the printer to Adobe PDF, so this will print to a new PDF file and select print. 12. Now you have a PDF of your army that can be used on either a table or printed out! If all this seems like to much work for you, WWX player Poom Pong has put together all the cards in a nice set of PDFs that can be printed out. Enjoy! I grew up playing DnD starting in the 3rd grade run by Ryan as well as many other games. I was pretty much his guinea pig for new games (CoC, Paranoia, Runquest, Rolemaster, Shadowrun, Aftermath, GURPS, Deadlands, and on and on...) I mostly played in his games and ran some games for my group of friends as I got older. Getting an expanded view on most RPG's I liked them all but swords and sorcery was always my favorite. In 1993 the culmination of all my favorite games were placed into one game and I loved it ... Earthdawn. 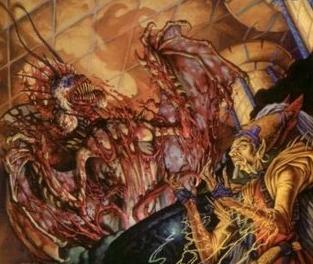 Earthdawn is a world that was destroyed by magic and the horrors it had unleashed. It was swords and sorcery, it was post apocalyptic, and it was horror. You played hero's that emerged from Kaers (Bomb Shelters warded with Magic) to venture into an unknown world (Post Apocalypse) that was torn apart by unspeakable horrors (CoC fix). I loved the story and the ideas the game had on magic items and building your character into a legend in the new world. The main thing I didn't like was the system... it was very complex... combats could drag on forever especially at higher circles. 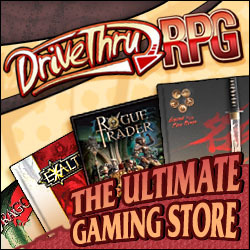 The last few years I have gotten into DCC (Once again because of Ryan) and attended the NT RPG Con. 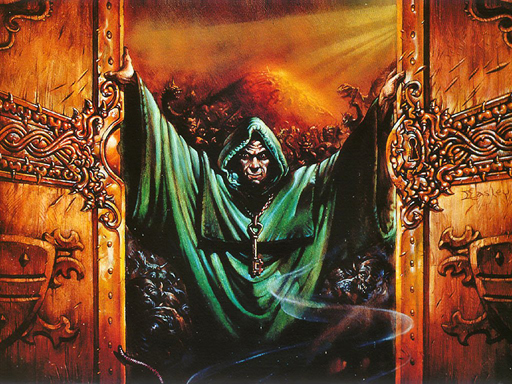 I played a lot of Old School games but in both years that I attended, I never saw Earthdawn. I decided to take DCC for all the freedom it gives and adapt Earthdawn to it. Player may choose to be a Dwarf from DCC book or a Dwarven Weaponsmith if the Weaponsmith is chosen use the following rules. Weaponsmith : No Sword and Board. May cast Blessing during combat as DCC Cleric. Add deed die for casting bonus. No Matrix needed. The Weaponsmith has a talent die that follows the same progression as the bard in Crawl #6. This die plus Int bonus is rolled for his talents. May forge and repair weapons and armor. Item History : May cast Detect Magic but only on weapons and armor . At 1st level the Archer can cast Magic Missile as a Natural ability. It doesn’t need a Matrix but can be lost. Swordmasters survive by their luck and wits and as such regain Luck as a thief per DCC book. Progression as Orc from Crawl #5. Mount Bond – At 1st level the Cavalryman bonds with his war mount. At 1st level the Cavalryman can bond with a War Horse, a Staijan (A bison like animal), or Thresher (velociraptor) . The Cavalryman gets a deed die as a warrior that can be used for anything while mounted. The Cavalryman has a telepathic link with his mount and can use his senses if needed. (DC 11 +Luck Bonus). If at anytime the mount is killed the Cavalryman loses d3 luck or d3 Stam(Players choice) until he can bond with a new mount. At 5th level the Cavalryman may choose to bond with a Thundra Beast(A lizard/rhino) or a Dyre (A bear/Bull). His bond with his original mount is lost. For the Staijan use the Large Herd Beast from Critters,Creatures and Denizens(CCD) Supplement pg. 56. For Thresher use Large Lizard on pg 154 CCD. Dyre use Huge Heard Beast but remove Gore attack and it attacks as a Kodiak bear pg 41 of CCD supplement. Use Halfling attack and save progression from DCC. Windlings gain Astral Sight, Flight and AC Bonus at level 1. Astral Sight : As Detect Magic. Can never be lost. Doesn’t require a spell matrix. Flight : Windlings cannot fly constantly. After 20 mins of flight the Windling has to make a Fort save if failed the Windling takes a 1 point of Stamina damage every round until he stops flying and rests for 20 mins. AC Bonus : Windlings get a natural +d3 to AC at 1st level due to their small size and agility. Beastmaster: At 1st level can cast Summon Animal and Find Familiar per DCC book. No Spell matrix required. At 3rd,5th,7th,9th level the beastmaster may gain another familiar in addition to the ones he already has. Luck : Windlings spend and regain Luck as a Halfling per DCC rulebook. Great Strength : Add d4 to Str at 1st level. Air Combat : May use deed die for any mighty deed involved in air combat. As Thief from DCC book. Gains two weapon fighting as Halfling. Gain Survival as Ranger Crawl #6. As Bard in Crawl #6 except they have no starting spells. They are able to cast spells from scrolls and Grimoires. They regain luck like Thieves and instead of choosing between Lore or Talents the Bard has both in place of starting spells. Ok thats enough for one post. In my next post I will cover Spellcasters and Magic.